This essay describes a particular abolitionist theory, known as the abolitionist theory of animal rights, which was developed as an alternative to the position developed by Australian philosopher Peter Singer. Singer embraces a form of preference utilitarianism, which promotes actions that maximize the satisfaction of the interests or preferences of those beings involved or affected. He gives priority to beings who have human-like self-awareness and can actively contemplate the future. Although he accepts that nonhuman great apes, dolphins, and elephants are self-aware in this way, he expresses doubt about other animals and regards many of the animals we exploit as living in a sort of eternal present. They have an interest in not suffering pain or distress, but they do not have an interest in continuing to live, or, at least, they do not have an interest that leads Singer to accord them the default presumption against use as replaceable resources that he accords to “normal” humans and nonhumans who have human-like self-awareness. Singer focuses primarily on issues of treatment rather than use and he advocates for welfare reform. 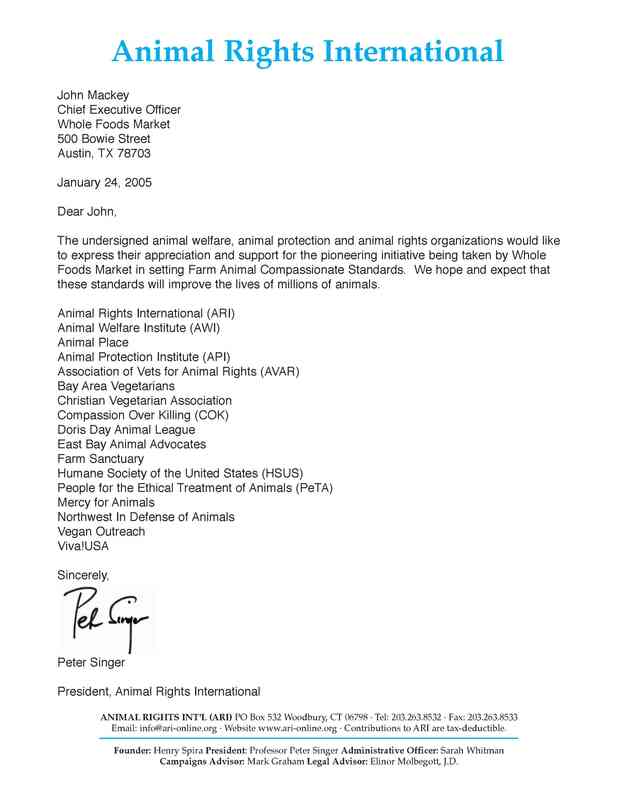 For example, in 2005, Singer spearheaded an effort, joined by most large animal organizations, including The Humane Society of the United States, People for the Ethical Treatment of Animals, Farm Sanctuary, Mercy For Animals, Vegan Outreach, and Compassion Over Killing, to publicly praise a U.S. based supermarket chain, Whole Foods Market, for adopting what could be called a “happy exploitation” labeling program. Singer might well be described as the primary figure of the “happy exploitation” movement that promotes the “compassionate” consumption of “higher welfare” meat and other animal products as normatively desirable and, along with welfare reforms generally, as the proper subjects of animal advocacy. This “happy exploitation” movement is now the dominant faction of the modern animal movement in North and South America, Western Europe, Australia, and New Zealand. There is a sense in which we can arrive at largely the same conclusion without invoking the notion of rights. We share a moral intuition that we should not impose “unnecessary” suffering and death on sentient beings; that other things being equal, the fact that an act causes or results directly in the suffering of a sentient being is something that counts against that act as a moral matter. There is, of course, a great deal of disagreement when it comes to what satisfies the necessity element here, but we generally agree that we cannot characterize pleasure, amusement, or convenience alone as involving any necessity or compelling reason. This is why most of us object to, for example, dog fighting or bull fighting, or “crush” videos, which are intended to eroticize the crushing of small animals by a woman’s foot. The abolitionist perspective is that the overwhelming amount of animal use involves only pleasure, amusement, or convenience. The most significant animal use both in terms of numbers of animals involved and in terms of cultural importance is the use of animals for food. We kill an estimated 58 billion land animals, and an unknown, but certainly not smaller number of aquatic animals, annually for food. Eating animal foods has generally been justified, at least in part, on grounds of human health and sound nutrition. Those grounds have, however, largely been discredited and it is now recognized that a vegan diet is sufficient for health. Moreover, an increasing number of mainstream health-care professionals are claiming that animal foods are detrimental to human health. And there can no longer be any serious question whether animal agriculture is an ecological disaster. The best justification for the staggering amount of suffering and death involved in the use of animals for food is that they taste good, we are used to eating animal foods, and they are convenient. Indeed, 99% of our animal use is transparently frivolous and contravenes a fundamental moral principle that we claim to accept. I posted something about this on my Facebook page, and I had to delete the comments and close the thread because of the horribly misogynist and violent comments that were being made. People are angry that Bachman killed the lion unnecessarily. There was no need, no compulsion for her to do so. She did not kill the lion in self defense. 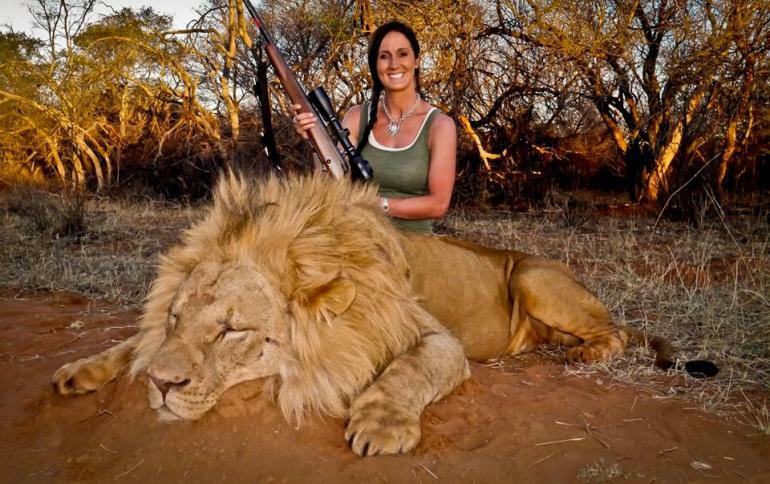 She killed the lion because she enjoys killing animals. And most of us think that that’s terrible; we don’t think that we should make animals suffer and die just because we derive some pleasure from it. We kill and eat about 56 billion land animals not counting fish. There is no necessity; no compulsion. We do not need to eat animals to be optimally healthy and animal agriculture is an ecological disaster. The best justification we have for imposing suffering and death on those billions of animals, many of whom have had lives far more hideous than the lion Bachman slaughtered, is that they taste good. So how exactly does this distinguish those of us who consume animals from Bachman? That’s a rhetorical question: there is no coherent moral distinction between her and most of us. The fact that Bachman kills “charismatic species” and the rest of us just kill chickens, pigs, cows, and fish is completely irrelevant. The Bachman matter is no different from the moral schizophrenia that we saw in the matters of Michael Vick, Mitt Romney, and Kisha Curtis. On the positive side, every time one of these cases erupts, we reaffirm our belief in the widely shared moral intuition that it’s morally wrong to impose suffering on or kill animals without a good reason. Ironically, we already believe everything we need to believe to reject animal exploitation altogether. It’s just a matter of coming to see there is no morally relevant difference between shooting a lion for fun or eating a steak because you enjoy it. In both cases, we have taken a life for no good reason. Let us hope that these episodes of moral schizophrenia cause the light to go on at least for some who make the decision to put their morals where their mouth is and go vegan. Do you Eat Like You Care? http://www.abolitionistapproach.com/wp-content/uploads/2015/09/aa_logo.png 0 0 Gary L. Francione http://www.abolitionistapproach.com/wp-content/uploads/2015/09/aa_logo.png Gary L. Francione2013-11-03 12:40:232013-11-03 19:03:50Do you Eat Like You Care?